No More Hotel Auditions, Says Union Representing Actors : The Two-Way SAG-AFTRA is calling for an end to auditions in private hotel rooms or residences, after a spate of sexual harassment allegations against powerful Hollywood figures. 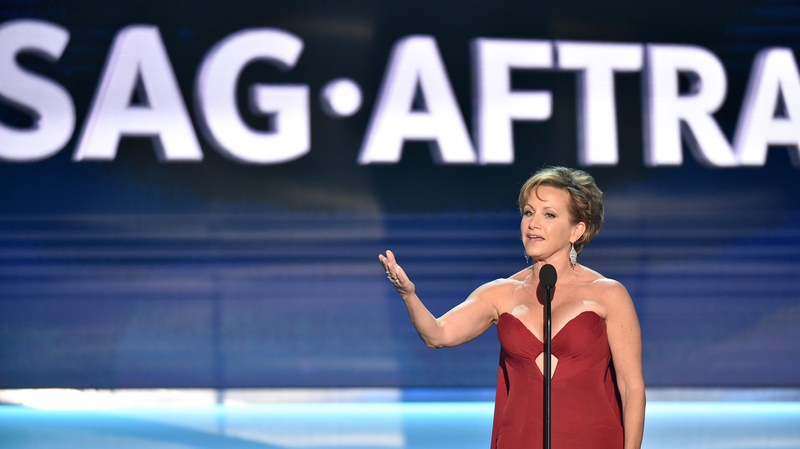 SAG-AFTRA President Gabrielle Carteris, shown here at January's Screen Actors Guild Awards in Los Angeles, is calling for an end to auditions at private hotel rooms or homes. SAG-AFTRA represents about 160,000 people, including actors, broadcasters and recording artists. (NPR employees are among those represented by the union). The hotel audition guidelines build on the union's Code of Conduct on Sexual Harassment released in February. Hollywood figures, including disgraced movie mogul Harvey Weinstein, are accused of making unwanted sexual advances on dozens of women in these private meetings. "We call on producers and other decision makers with influence or control over decisions that can impact a career, to STOP holding professional meetings in these high-risk locations and find alternative, appropriate locations for professional meetings," the union said. It also called on union members to not agree to such meetings. If there is no "reasonable alternative forum" for a meeting, SAG-AFTRA is encouraging members to bring another person with them, called a "support peer." The union said the new guidance was issued after hearing from union members, experts and industry stakeholders. It's not clear how the guidance will be enforced, though SAG-AFTRA asks for members to report any breach-of-contract provisions. In a letter to members in February, Carteris and National Executive Director David White said that the revelations about widespread sexual harassment in Hollywood present "a unique opportunity for unprecedented change and is a call to action for us all." The Producers Guild of America has welcomed the new guidance, as The Associated Press reported, and released new guidelines of its own to combat sexual harassment earlier this year. "We support this practice as an industry standard," PGA Presidents Gary Lucchesi and Lori McCreary said in a statement to the wire service. "With our industry's guilds working in constructive and coordinated fashion, we look forward to the day when workplace harassment and misconduct is considered a vestige of Hollywood's history."